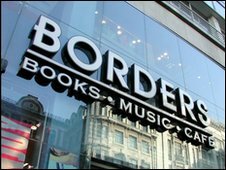 The Borders bookshop chain in the UK has started a closing down sale in all of its 45 stores, the BBC has learned. But the company, which went into administration on Thursday, will carry on trading until a buyer is found. The administrators MCR are hoping to sell the entire group as a going concern but admitted they faced a tough retail market. And it refused to rule out the liquidation of the chain, which would result in the loss of all 1,150 jobs. Borders, which also owns Books Etc, has suffered from increased competition from online retailers and supermarkets. MCR added that there was a window of three to four weeks in which to sell the business. It has also hired specialist liquidators Hilco to advise, says BBC business correspondent Joe Lynam. He added that the administrators are aware that a closing down sale is only permitted if the business is genuinely winding up. All Borders employees were contacted on Saturday morning to update them on the situation.